FLUFFY NO-KNEAD DINNER ROLLS — A bowl and a wooden spoon is all you need to make these fluffy, no-knead dinner rolls. 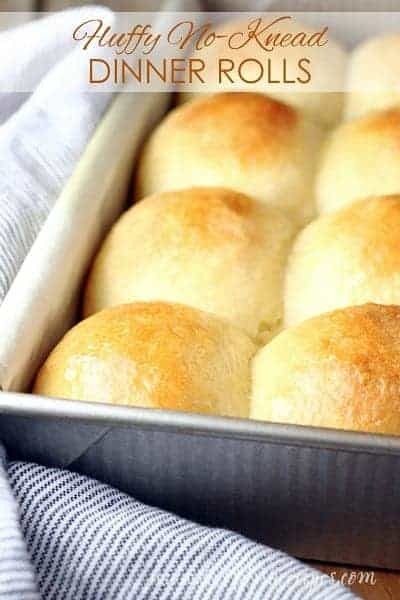 Everyone needs one really good, really easy dinner roll recipe in their repertoire, and these Fluffy No-Knead Dinner Rolls are it! You don’t even need a fancy mixer to make them. Just a bowl and a wooden spoon. Really, the only special skill you’ll need to make these rolls is patience. Admittedly, it’s not my forte, but these rolls are definitely worth waiting for. These rolls need about three hours total of rising time, both before and after shaping them, so do be sure and get started in plenty of time. But these rolls can be made formed and then refrigerated if you want to make them ahead. Just cover your shaped rolls with plastic wrap and refrigerate them for up to 24 hours. Then take the rolls out of the refrigerator 30 minutes before you plan to bake them. This is a great way to get a head start on a big meal like Thanksgiving dinner. Just a few tips for making any kind of bread: if your yeast doesn’t froth after five or so minutes, your liquid is probably too hot or too cold. To test the temperature, I usually use my finger. If it would make a pleasant bath, it’s probably just right. And it always helps to put your dough in warm place to rise. I usually turn my oven on for about 30 seconds, then turn it off. Then I place my dough inside to rise. These rolls come out tender, light and fluffy. And there’s nothing better than a warm, homemade roll with dinner. Especially when it’s spread with some soft butter. 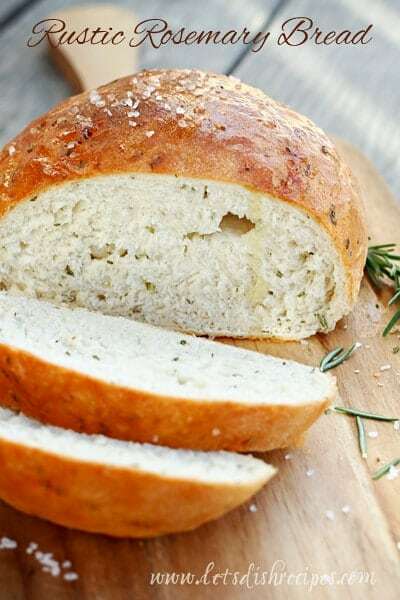 Be sure to save this Fluffy No-Knead Dinner Rolls recipe to your favorite Pinterest board for later. In a medium bowl, combine the yeast, warm water and 1 tablespoons of sugar. Let stand five minutes, until frothy. In a separate bowl, combine the flour, salt and remaining 1/4 cup sugar. Make a well in the center. Add the milk, butter, eggs and yeast mixture to the dry ingredients and mix with a wooden spoon until combined. The dough will be slightly sticky. Cover the dough with a clean cloth and place in a warm place to rise for 60-90 minutes, or until doubled in size. Spray a 9x13 inch baking pan with non-stick cooking spray. Punch down the dough and turn onto a floured work surface. Divide the dough into 12 equal pieces, dusting with flour as needed for handling. Form the dough into balls and place into the prepared pan. Spray the rolls with non-stick cooking spray and cover with plastic wrap. Let rise for 30-45 minutes, or until doubled in size. Preheat oven to 400 degrees. Bake rolls for 15-20 minutes, or until golden brown. Remove from oven and brush with melted butter, if desired. These sound delish! In the ingredient list, it says 1/4 cup plus 1 tbsp. sugar. In the directions, it says add 1/2 cup. Which is correct? Looking forward to making, baking and eating!! It’s 1/4 cup. That was a typo in the instruction. Thanks for catching that! When I put a clean cloth over the dough to rise do I leave it in the bowl? 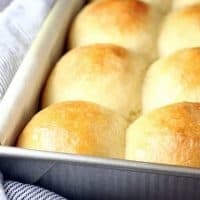 I want to make these rolls for Thanksgiving. I need at least 2 dozen. I won’t double the recipe, but at what point can they be frozen? Wonderful! I ended up w/ 16 rolls and could easy have been 24 rolls had I made them smaller. I may make them in a sheet pan. This is my mom’s same recipe that she makes for her horn rolls (lovingly called Grandma’s Buns. )I’d lower the sugar amt for any savory butter (garlic, herb, etc.) toppings. Never made yeast rolls before. These were easy and came out perfect! 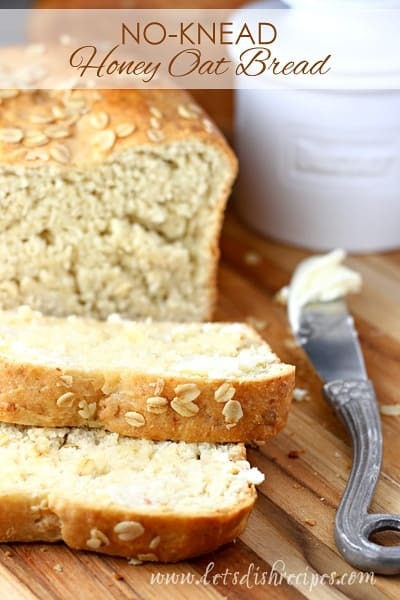 Thank you for this recipe, this is my 2nd bread recipe & loved it. Easy and good. I usually use instant, but either kind will work. Danelle – thank you for your quick reply! I used instant and these turned out fluffy and delicious!! I made 12 rolls which were very large – next time I’ll try smaller – maybe 16? When using instant yeast when do you mix it in. I mix it in at the same point in the recipe, with the water and sugar, regardless of what kind of yeast I’m using. About how many larger size sandwich rolls would this recipe make (instead of smaller dinner roll size)? It’s really hard to say without knowing exactly what size of rolls you’d be making. 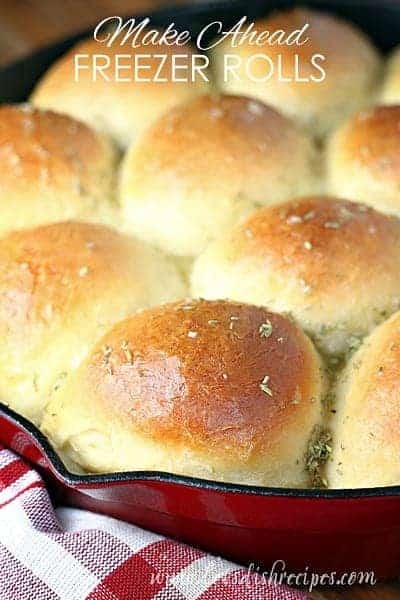 The recipe already makes pretty big dinner rolls–some people say they’ve gotten up to sixteen dinner rolls instead of 12. So I’d say you’d get at least 8. But it really depends on how big they are. I have 2 questions, can you use AP flour instead and can you use butter with salt? I’m sure it’s too late now, but in case anyone else stumbles across this question, I used AP flour and salted butter – and just reduced the amount of salt to about 3/4 of a tsp. They turned out a bit denser than I imagine they would with bread flour, but they were still absolutely amazing. Since I wasn’t going to have time on Thanksgiving morning, I made the dough about 24 hours in advance – I let it proof for about 45 minutes, then refrigerated it. They turned out absolutely amazing, and I’ve had no fewer than four mini leftover turkey sandwiches. Can’t wait to try your other recipes! Thank you. So glad you liked the recipe! Leftover turkey sandwiches are the best! Has anyone tried using Almond Milk made for cooking for this recipe? I can’t eat milk, but I want a good dinner roll recipe. Thanks for this great recipe. The rolls came out perfect – light and fluffy. I would say dividing the dough into 12 is good for hamburger or sandwich rolls, but for dinner rolls try dividing into 16.